Sometimes I hatses the interwebs. I watched a video that told me that I was capable of installing a Volquartsen trigger on my sweet new Ruger 22/45 pistol. I was promised the moon and the stars, a fantastic trigger pull and no more ignorant magazine drop safety. Disassembly was easy. Disassembly is always easy. Instead of having a sweet trigger on my sweet little pistol, I had two bags of small parts and a gun shaped sculpture. Luckily, my gunsmith was up for the challenge. Here’s the pistol all put back together. I picked it up yesterday and took it straight to the range. It was already more accurate than me, now it’s massively more accurate than me. I have no further excuses, and simply must practice harder. 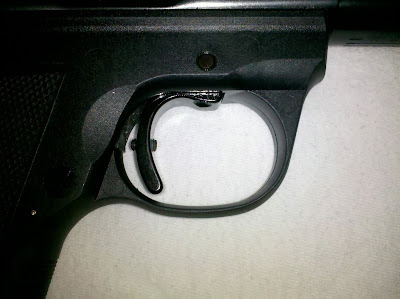 Here’s a photo of the trigger itself. You would think that the Allen screw poking out of the trigger would be a problem, but you really don’t notice it that much. The trigger is very light, crisp, and SUDDEN. You should have seen the gunsmith grinning when he tested it in front of me. I got the impression that he didn’t want to give it back. This will be my training gun. Ammo’s cheap, it’s brutally accurate, and not in the least bit intimidating to shoot. Not only will I be doing most of my pistol practice with this, I will use it to teach others to shoot. I have a couple of friends who want to make their first range trip, and this gun will be the first gun they shoot. Readers who want to give it a try should let me know. I shoot at PDHSC in Raleigh. We could meet up and shoot together. I generally shoot on weekdays, before the dinner rush. 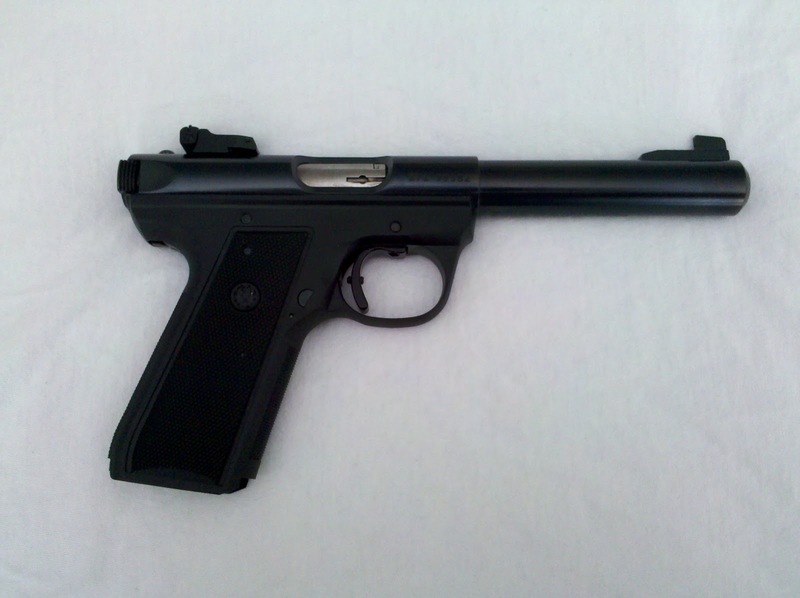 So I got the call today to come pick up my new Ruger 22/45. 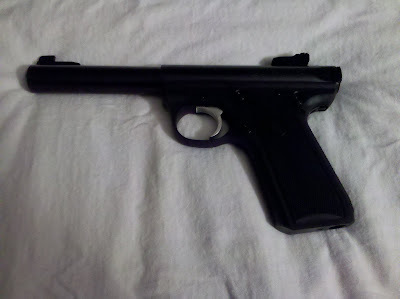 This means that my brand new pistol will be coming with me to NorthCoast II in Ohio. Now all I have to do is pick up my Ruger 10/22 from the gunsmith tomorrow. He was installing sling swivels and the new Tech-Sights. Wait a minute. When did I turn into a Ruger fanboi?